If you’re a fan of werewolves, it’s probably a safe bet that you’re pretty into run-of-the-mill wolves as well. 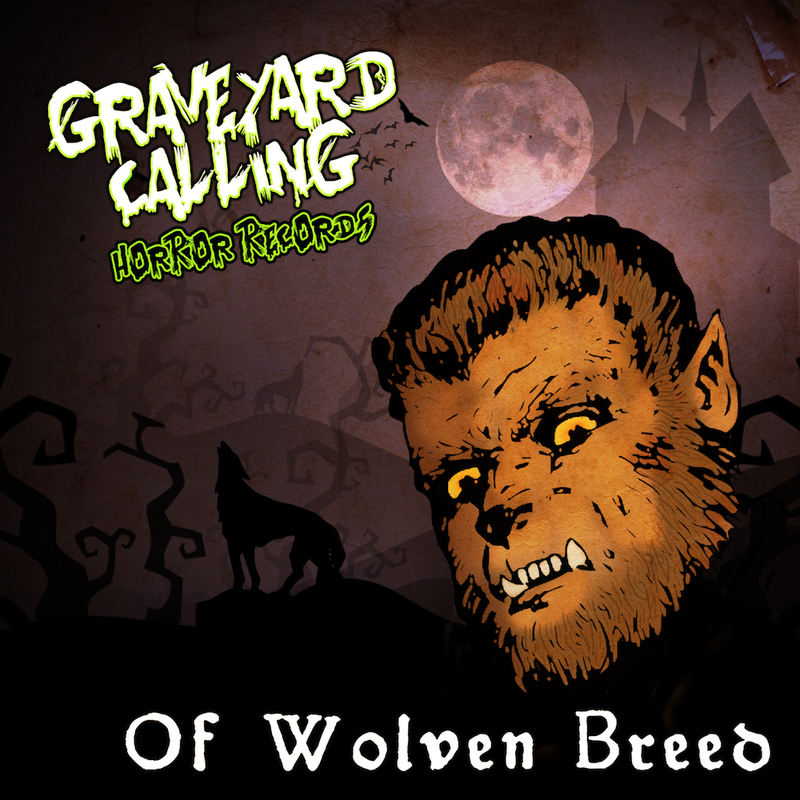 In that case, cassette/digital record company Graveyard Calling has a treat for you: Of Wolven Breed, a werewolfy compilation from the artists on the Graveyard Calling signed artists. Look at that handsome wolfman. The compilation will be available from the official Graveyard Calling website for only £2.50, a bargain for 22 tracks. And those who like wolves will be pleased to hear the kicker: all proceeds from the sale are going to the International Wolf Center, which helps to raise awareness about wolves. It raises awarewolves. The release will be 76 minutes long, and will feature an all-new exclusive track from our friend in Werewolves in Siberia. My last “soundtrack” post was filled primarily with hard rock/metal, and I realize this. Those are usually the genres that I stick with, so by default, those are most of the types of songs I have in my playlists. But by no means are those the only songs I indulge myself in. After all, you don’t always want to stick your snout into someone’s ribcage and gnaw on their internal organs while they scream. Sometimes you just want to dine on a quiet meal of long pig with some potatoes on the side. Maybe with a nice merlot or something. I digress. Here is the Lycanthropology 101 list of songs to gently nibble people to. Found by accident, actually, while flicking through werewolf-related songs on Bandcamp. After browsing the lyrics, I was expecting something a little more punk rock than what I actually got, but somehow it managed to work anyway. Those who saw my Werewolf Band Roundup in February probably remember my short, bemused paragraph on the vanished werewolf metal band Pandemonic. Well, somehow or another, the lead singer of Pandemonic, Mikael Ullenius, stumbled upon the post. And what do you know, he unearthed a lot of old Pandemonic material. The first was, of course, putting some songs back online. Full-length album The Authors of Nightfear and the 2002 demo Ravenous have been posted in their entirety for free download from Last.fm, with an added comment from Ullenius that he’d post the 2004 demo The Art of Hunting as soon as he could find better bitrate versions of the songs. Ullenius himself can be found on Twitter, which he appears to have joined only recently. California werewolf metallers GrimWolf have confirmed that they are entering the studio this weekend to begin recording drum tracks for a new album. This album will be the long-awaited follow-up to their 2011 debut full-length, Lycanthrope. GrimWolf have not revealed the title of their new album yet, merely hinting to keep an eye out for the next few weeks. Father/daughter grindcore outfit Sockweb have released their debut full-length, a concept album named Werewolf. The album was funded through a successful Indiegogo campaign last year, though due to various complications was pushed back several months. But they are back now, and as of March 25, the album has finally dropped! Or, if you aren’t sure you want to drop $8/$15 on the full-length, check out the Bullies Are Mean EP—get a taste of four tracks from the full-length at the low price of $1! Check Sockweb out on Facebook here! For those of you who follow my Twitter, you have probably heard that lately I’ve been enjoying the hell out of an 80s-inspired synth rock project called Werewolves in Siberia. Gray and drizzly out today. "The Rising" by @werewolves_i_s makes for good driving music in this weather. Makes me feel all introspective. It’s dark, contemplative, and delightfully evocative. You can definitely hear the 80s inspiration in the music as well; if you close your eyes you can practically feel the VHS player humming in the background. Still, it has a modern touch, with a clean sound and rock/metal inspired drums. For me, it’s perfect music for things like driving and writing: when I need something to set the mood, but doesn’t have distracting lyrics either. (I like to sing, what can I say.) What’s more, the project has a new album coming soon, so I got in touch with Chris Cavoretto, the man behind it all, to talk about Werewolves in Siberia. Nattens madrigal – Aatte hymne til ulven i manden (that is, in English, Madrigal of the Night – Eight Hymns to the Wolf in Man) turns 17 today. On the 2009 IGN list of ten great black metal albums, Nattens madrigal is often thought of as one of the defining concept albums regarding lycanthropy. The album documents the transformation of a werewolf who, succumbing to the efforts of Satan, turns to evil, wandering the city in a feverish rage before finally murdering his lover, and waking to blood and wine on his hands. The album’s recording is lo-fi and thus takes some getting used to for those who don’t enjoy the sound provided. It is, however, a significant album, and as such if you’ve never given it a listen (or given its lyrics a read-through), you should check out Nattens madrigal today.